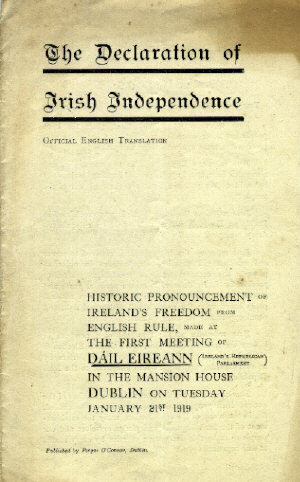 The bill seeks to formally recognise 21st January as "Declaration of Independence Day" as it was on this date in 1919 that the inaugural meeting of the first Dáil took place in the Round Room at Dublin's Mansion House. It is hoped by those who proposed it, that the bill will be passed in time for the centenary next year. The next few years of centenary events for the Freestate should be very uncomfortable, the genesis of the “Irish State” must be explored and exposed, much will be delved into and as Republicans it is our opportunity to expose the Freestate for what it is and its origins. We cannot allow these next few years to pass without challenging the state line and conducting a campaign of education for the nation. If we fail to do this, we leave ourselves in a dangerous position, and generations of Irish People to come will be indoctrinated unchallenged with utter lies. Decades have passed, generations have changed, living memory of 1916 and the following years are gone, what we are left with now is written history. For people not overly interested in politics or history and those who rely on state propaganda the next few years ensures that they will force feed bucket loads of state revisionism and downright lies. They will be told that 1922 was the year that we got rid of the Brits in most of Ireland. 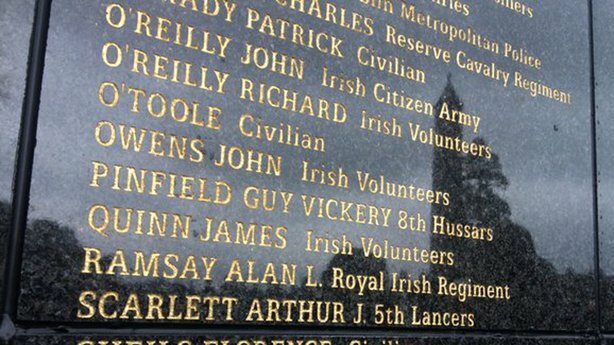 That Ireland got most of its independence and that the people who created this “Free” part of Ireland are heroes, that they come from the same tradition as those who fought in 1916, took part in the 1918 election and that they are a continuation unbroken from the First Dáil Eireann. People will believe that the 26 County state is the Republic declared in the 1916 Proclamation. One of the main and most dangerous lies that the Irish public will be fed is that the Free State draws its constitutional line of authority from the 1916 Rising and the all-Ireland General Election of 1918. 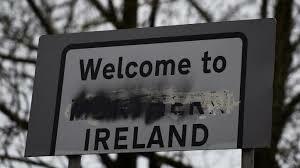 We need to shout it from the rooftops, that in reality, the Free State originates from Britain’s Government of Ireland Act 1920, following a decision made at the only sitting of the House of Commons of Southern Ireland in January 1922, formed under this British Act. 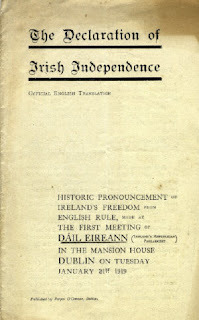 The Centenary of 1916 was nauseating enough, witnessing the great and the good of the Political class of the Freestate talk about the great heroes of the rising, reading the proclamation while conveniently ignoring that it declared independence for the whole nation, while entirely neglecting to even mention the evident reality that Ireland is far from free and that the work of 1916 is most certainly unfinished business. 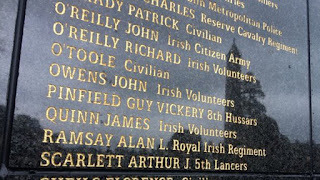 Couple that with the fact that these shower of counter revolutionaries and British Collaborators sullied the memories of the great patriots who died for Ireland’s independence by erecting a wall in their memory, and also including the names of British armed forces who were responsible for their deaths. I believe we should look at the next few years as an opportunity, the elephant in the room has to be addressed and while the Freestate are putting their every resource into these lies, to counter this we must also up our game. We must expose them to the people, ensure that they are aware that the Freestate is the complete antithesis of the Irish Republic and everything the First Dáil Eireann stood for when it adopted the declaration of independence for the whole nation. That much like the 6-County state, the 26-County State also exists in complete defiance of the Irish Republic proclaimed in 1916 and re-affirmed through the first all-Ireland Dáil Éireann. The Freestate have been relentless in the last few years in trying to normalise the current set up in Ireland. The Partition of Ireland is not even on their top ten things to address; the ongoing British occupation is not at all concerning. They are more interested in hosting British Royals it would seem or attending British Army commemorations. The introduction of a national day of Independence has to be seen as yet another attempt to close a chapter of Irish History. The independence of Ireland is yet to be secured. 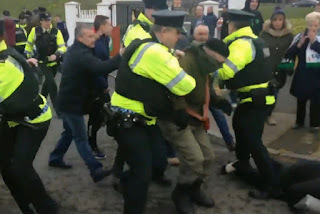 When Ireland is united and independent and truly takes its place among the free nations of the world, then and only then can we consider such a day. If we allow such a ridiculous notion to pass the next thing they will be doing is writing Robert Emmet’s Epitaph! !